Tired of your valve covers leaking? First make sure you don't over tighten them. When they feel a little loose is when they're just right. ALWAYS torque them to specs until you get a feeling of how tight they should be. I stopped using silicone on the gaskets. I now use 3M Super Weatherstrip adhesive. I like the yellow stuff. It comes in black, but yellow works excellent. This stuff is sometimes called "gorilla snot". Really stinks too, fumes are mean. I apply a thin bead to the gasket side that goes against the valve cover. Getting gaskets off, is much easier using a 3M "cookie". It's a disc sander that mounts in an air die grinder. About 2" in dia. Also works good for removing cast finish when polishing aluminum. Really speeds up the polishing process. I had a Jeep CJ with a soft top for a while. The top was old, and the "clear" parts were white instead of clear. I bought this Jeep to plow snow with, so visibility was a major problem. I found something in a JC Whitney catalog, and I tried it. The stuff works great!!! I did my dash gauges, my taillight lenses, blinkers. My sunglasses even. The CJ windows came out crystal clear. I even did windows on my father's boat. 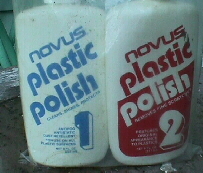 NOVUS PLASTIC POLISH WRITE IT DOWN. THIS STUFF IS A MUST, REMOVES HAZE. I found this paint at a swap meet. I had never heard of it. It was designed to seal rust. You could sandblast parts, or wire brush loose rust off, then apply heavier. It's a Moisture Cured Urethane (MCU) called Mastercoat. This stuff is great. It contains 60% aluminum. It's fuel proof, acid proof, brake fluid proof. Has extremely high chip resistance. It was $30 a qt 6 yrs ago. I bought over 10 qts over the years. Used it on 3 different vehicles, and 4 different snowplows. They also make a two part clear coat that can be tinted with pigments to any desired color, or left clear. Talk about high gloss!! Acetone doesn't even soften this stuff until it's been soaking in it for hours. I'm not sure if he's on the web or not. He does travel the USA to swap meets. It has it's own thinner for thinning, and cleaning the gun. He recommends you brush on the first coat, for better coverage, and higher build. This stuff is high build. It will hide rust pock marks on a chassis. It may take sanding, and a few extra coats, but the thicker you put it on, the better the protection. I used the clear coat on my snowplow. It was like glass, the snow didn't stick at all. No rust. I replaced my cutting edge, and went over the clear, with Meyer Sno-Flo yellow. The clear is just as slick, or slicker than the OEM paint. I gotta get more ! 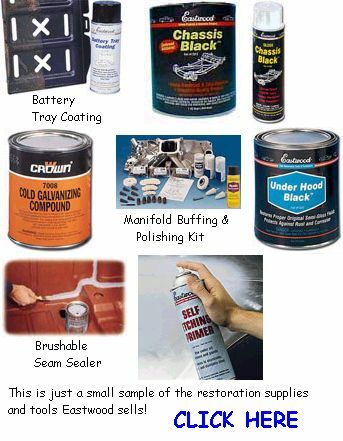 !Look for Mastercoat Industries, in West Milford, NJ, in the yellow or white pages online. Stainless Steel--I love this stuff !! A metal that will stay rust free, nearly forever? Yes! Anything chrome plated, sooner or later will rust. It happens to all of us. Have you used a fork, knife, or spoon recently? How old is it? No rust on it, is there? It's stainless steel. How many times has it been in the dishwasher? Left soaking in the sink? (for days, weeks even) Stainless comes in many grades. Some are prone to surface rust. Others are non magnetic. It's all around a great metal though. I've had success welding it to mild steel even. I have 16ga. T-304 stainless, welded in two of my tucks. I used it to replace the cab floor pans. Bye bye rust !! It's really hard to bend it though. I replaced my dual exhaust on my Chevy with 14ga. T-409 stainless 2 1/4" pipes. I won't be buying an exhaust every 2yrs anymore. I got Borla Stainless mufflers too. I could be happier, because the pipes have surface rust. I was hoping they'd stay chrome-like. At the time, all I could find was T-409. Now I see T-304 sold, but for a lot more $$. It comes in straight lengths and has to be mandrel bent. I paid a friend of a friend $100 to install it at a muffler shop after hours (Midnight Auto is now open!!) I decided to make it exit straight out the back, under the rear bumper. I'll try to find more info on different grades of stainless. I know it has to do with Copper and Nickel (I think) content. If I can get something made of stainless steel, polished, and the same item made of whatever, and chrome plated. I go with the stainless. I had a chrome tube grill on my truck. After 6 months it started rusting. I replaced it 6yrs ago with a stainless one. I wipe it down with Windex on a rag every now and then. It's still shiny as day one. It gleams. I use stainless steel bolts whenever possible. I replace fasteners when Removing and Replacing parts. I found this out at a young age. At some point, a large box of stainless steel bolts and nuts followed my father home from work . They were 3/8-16x 1 1/4". A popular thread(3/8" - 16),and a good length for all sorts of things. A bolt was stripped holding the latch on our gate. I used one of Dad's bolts. That was over 15yrs ago. It STILL hasn't rusted!! I know now they're grade 4 bolts. I bought others at a swap meet. They were grade 2. Same garbage grade (weak) as from a hardware store. Has no place on a vehicle really. I did use them for ground bolts. I mounted my license plates with them. Stainless is harder than mild steel, so a bit stronger naturally. That's why YOU MUST ALWAYS USE AN ANTI-SEIZE COMPOUND ON STAINLESS STEEL BOLTS!!! !They naturally "spall" or "gall" softer threads. Such as in aluminum, and mild steel or cast iron. Header bolts for instance. Forget the Never-Seize, and they'll be welded in. (not always, but likely). #6 x 3/4"up to #6 x 1 1/2". Number 6 is the size, and the length follows. I used all Phillips heads. (I hate Torx) I have two trucks, a 77 Chevy, and an 80 GMC. I want to keep things as close to identical, to make repairs more practical, as far as tools I need. I also replaced many of the Metric fasteners on the GMC with SAE bolts. I really don't want metric duplicates of all my tools ($$). I had a dim headlight. It was a bad ground. The bolt was rusty, as was the tooth washer. I replaced them with stainless. Haven't had a problem since. It was 2 yrs ago. I also replaced the bolt holding my battery ground to my engine block, with a stainless w/tooth washer. There's a company in Pennsylvania. Totally Stainless. They have lots of hardware and more. Not sure if they're on the net. Try the yellow pages, or white pages online. The top of my Snowplow's hydraulic power unit has a reservoir fill hole. This hole is only about 3/8" dia... Very difficult to fill. Yes, most fluid bottles come with a screw on top, that you cut the end off, good idea. Western plow owners, use ATF. These don't come with the neat spouts. I keep a spout from a bottle of 90W gear lube in my truck. I use it to put motor oil in without a funnel. To put ATF in without a funnel, as well as my hydraulic fluid, and power steering fluid. It screws right on to a lot of different fluid bottles. Aluminum polish, and Brass. I like Wenol. It works well, and leaves a nice shine. 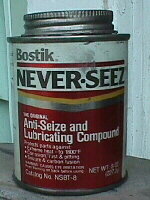 I use it on all my aluminum under my hood, like the AC accumulator, AC coupling nuts, and aluminum parts of the lines. On my polished aluminum intake manifold, chrome valve covers, and air cleaner too. Shines up the radiator cap nicely, and works great on Chrome too. If you have a cast aluminum part, you can polish it to a mirror like finish. The process is time consuming and tedious, but not that hard. Eastwood has all the tools you'll need, and they even have kits with everything you'll need. Simple Green is an excellent product. I like to use it to get brake dust off wheels. Degreasing engines and axles, t-cases, etc. Cleans up fiberglass well too. Takes off the black film you often see on white fiberglass. It's good for degreasing BBQ grills, and fireplace glass doors. Takes the brown mud haze off tire sidewalls (and any Armorall type stuff too!) Make sure to re apply tire protestant after cleaning. Takes the mud haze off wheel wells, chassis, and painted inner fenders. It's bio degradable, so as long as you flush the area your working in when done, the Simple Green shouldn't harm anything. Mud haze is harmless, but remember if you're de greasing, the grease is harmful. Maybe not as much after broken down, but I degreased a used Pick-up bed, before I mounted it on my truck, over a grass area. I flushed it good when done. A week later, the grass was dead, so be careful where you clean. Simple Green is an excellent product. I like to use it to get brake dust off wheels. Degreasing engines and axles, t-cases, etc. Cleans up fiberglass well too. Takes off the black film you often see on white fiberglass. It's good for degreasing BBQ grills, and fireplace glass doors. Takes the brown mud haze off tire sidewalls (and any Armorall type stuff too!) Make sure to re apply tire protectant after cleaning. Takes the mud haze off wheel wells, chassis, and painted inner fenders. It's bio degradable, so as long as you flush the area your working in when done, the Simple Green shouldn't harm anything. Mud haze is harmless, but remember if you're de greasing, the grease is harmful. Maybe not as much after broken down, but I degreased a used Pick-up bed, before I mounted it on my truck, over a grass area. I flushed it good when done. A week later, the grass was dead, so be careful where you clean. Also works on vinyl, like floor mats. Be careful, full strength this stuff may turn vinyl a few shades lighter!! Read the bottle, and dilute accordingly. It's much cheaper to buy a gallon of this stuff, and re fill your own squirt bottle. My mother cleans half her house with this stuff now too. I will use Go-Jo type cleaners. Fast Orange etc.. I really don't like how they leave your hands feeling sticky. I use Boraxo�. I like the grit. I also use a brand called Pax-Lano-Sav. I like to save a few lengths of different size hoses. They're good for protecting wires from rubbing on metal. Like where you pass a wire through a hole in the frame. Just cut a piece to a good length, split it long ways with a razor, slip it over the wire(s), and into position, and wrap it with some electrical tape to hold it shut and in place. I haven't tried this on my truck yet. My Mother has been using it for years. When driving her car in the rain, you barely need the wipers. I took my brother's 95 Dodge Ram on a trip a few months ago. I was going 60mph in the rain, on the Parkway. I lost the drivers side wiper blade half way through my trip there. I kept going, with the wipers off. I could see fine. I was amazed!! I bought a new blade when I got to my destination. Guess Rain-X works. I'm sure windshield shape and angle affect how well though. HERE'S TWO HANDY TOOLS IF YOU DO BODY WORK. ANY SHEET METAL WORK ACTUALLY. THE CONE SHAPED TOOL, IS A STEP DRILL, FOR SHEET METAL. IT DRILLS FROM 1/2" UP TO ONE INCH, IN INCREMENTS. THE SMALLER TOOL, IS A SPOT WELD CUTTER, SORT OF A MINI HOLE SAW. A SPARE CUTTER SITTING NEXT TO IT. YOU CENTER THE SPRING LOADED POINT OF IT ON THE WELD CENTER, PRESS DOWN AND CUT AROUND THE SPOT WELD. WORKS GREAT. THEN GRIND OFF THE LITTLE CHUNK OF METAL LEFT, WITH A 4" GRINDER, AND 80, OR LOWER GRIT. FORGET ABOUT DRILLING THROUGH WELDS. NO MORE MAKING HOLES TO BREAK SPOT WELDS. USE THIS TOOL TO CUT THROUGH THE LAYER OF METAL YOU'RE REMOVING ONLY. I GOT THIS ONE AT A LOCAL SWAP MEET.